I guess I am due a little general update. I have kept on working on the floorboards we have, which is slow going. I thought that the wood needed a little sealing before applying the waterproof oil (which I think is linseed oil based), since oak is so porous. On my tests, the wood ended up very rough after just oiling over the dye, even after lightly sanding with 280 grit. I thought of shellac, but sealing the surface to the extent that it wouldn't absorb the oil concerned me, so I did a little research. 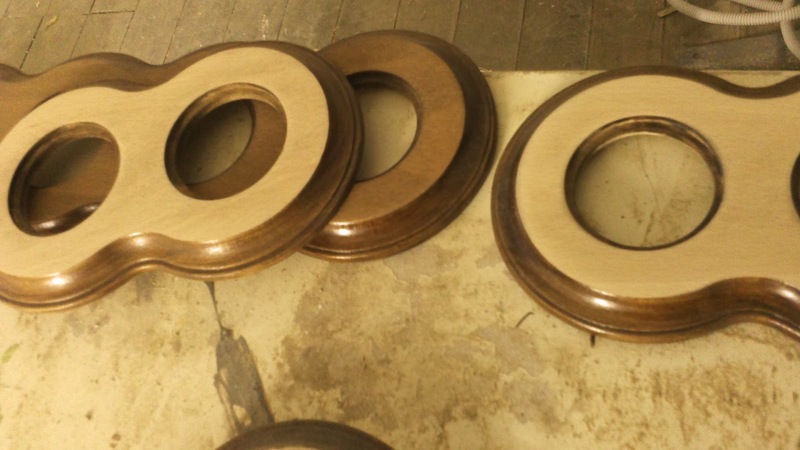 Reassured that sealing with shellac isn't a black or white business, and that wood can be just partially sealed with a relatively thin concentration of shellac, I made some tests which were satisfactory. I have a good Spanish furniture restoration book somewhere in which there are recipes, but I couldn't find it, so I turned to the internet, which of course churned out anglo-saxon recipes with pounds ad gallons and so forth. Very confusing, not indicating if ounces are fluid or by mass or what? I simply made my own "recipe" and tested it: 250 ml rubbing alcohol to 30 gr of shellac (the shellac I find locally is "lemon shellac" flakes - fairly light). After I used 500ml of this on a number of boards - it goes down fast! since I ended up giving two to three layers of the more diluted mix, I then made a 250ml/55gr mix that I still have to test. I then tried the oil on top of the shellac on the boards I had ready (after very lightly sanding 280 grit + 000 steel wool), and it certainly didn't absorb nearly as much, and a second layer would have just sat on top, so after 24h I wiped the excess and proceeded to sprinkle my test board with water. I left the water there to dry, and apart from some hard water deposits (to be expected, our water softening system is not running yet), the wood was unmarked. This will never be as protective as a polyurethane varnish, but I strongly dislike the plasticky look and feel of it, plus I do actually enjoy maintaining the wood, so we will go with this finish. It can always be refinished if we tire of it. We are also planning on adding a few tiled areas in the bathroom to minimise water damage. I was never at all satisfied with how the switch covers turned out, even after trying out so many different lacquers and so many layers. I decided to sand off a switch plate and try something else entirely. Excuse the phone pic. I'll get better pictures and comparison pictures soon. I only sanded the flat part, since the routed part did already look pretty good and it would also be nearly impossible to get it done well and quickly. I got rid of all the layers on this area with an orbital sander and 120 grit paper, and lightly sanded the edges by hand with the same grit. I then dyed it with the same walnut shell mixture I used for the floorboards. I was afraid it was going to be blotchy, since it is beech, but it was better than the water based tinted lacquers I used before. I then sealed with 3 or 4 layers of shellac, then finished with 3 layers of gloss polyurethane varnish. I liked the result, so proceeded to do the same to a bunch of switch covers. 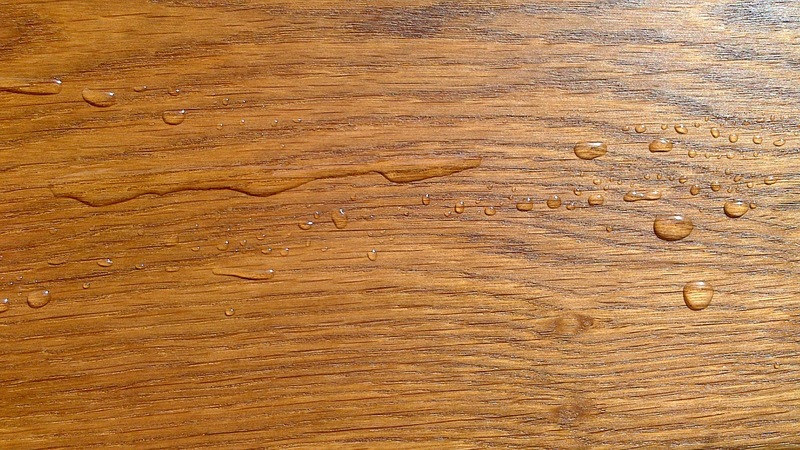 Why polyurethane varnish, which I just said I don't like? Well, these few are for the workshop and bathroom, where you often have wet or very grimy hands. I will do the same for the kitchen plates, but will probably try out something else for the rest of the house. I have to think about it. Switch plates always get so dirty! 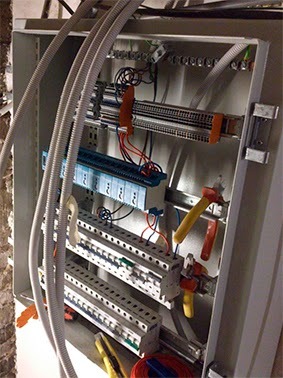 Pim has been working a lot on the electrical installation. Both upper stories already are working! there is electricity on the plugs and the lights can be switched on in the electricity cabinet which we have placed in the basement (the switches haven't been set up yet). It is a great development to be able to use power tools and lights without long and extremely annoying extension cords all over the house (for technical and safety reasons, we had disabled the old wiring on the first and second floors a while ago). Pim's dad has now installed the rest of the windowsills - all the windowsills for which we had a stone, that is (still missing ground floor toilet and workshop - which perhaps will be wood), and Aïda and Pim have also been working on the insulation and pipes for the bathroom. The bathroom is our main goal now, since once it is set up we can start up the heating (it is getting so warm, though, that we may not need it!) and… move in! Lots of work to still be done in the bathroom, though. Floorboards, walls, tiling, evening out walls, installing shower, sink and toilet, radiator… We have already ordered the shower glass enclosure (actually only half closed), and we are about to order taps, washbasin and shower tray. If we could move in this summer it would be great! Oh! And finally we planted a geveltuin! (façade garden). 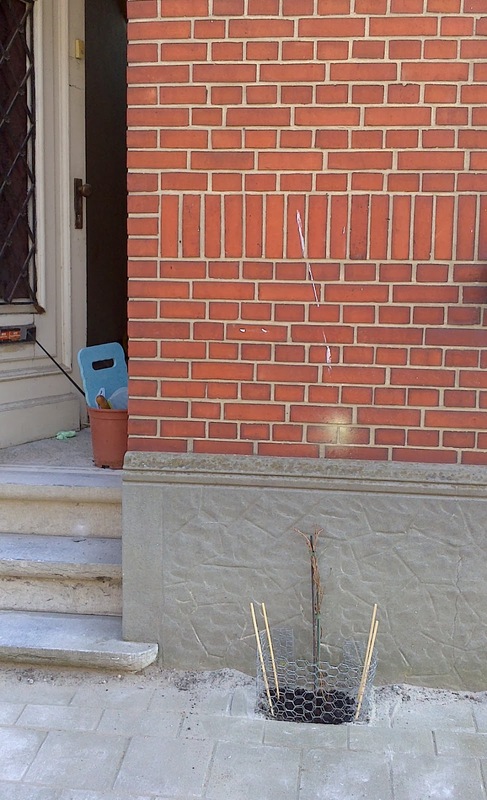 This is something I have really been looking forward to :D We sent the request to the townhouse last year, but it took a long time to be approved, so it was too cold to plant at the time. This winter has been so unseasonably warm, with only two days of frost (!) that in fact perhaps we could have planted in autumn anyway. But we planted now. The last days have been very warm as well. Not very impressive just now! 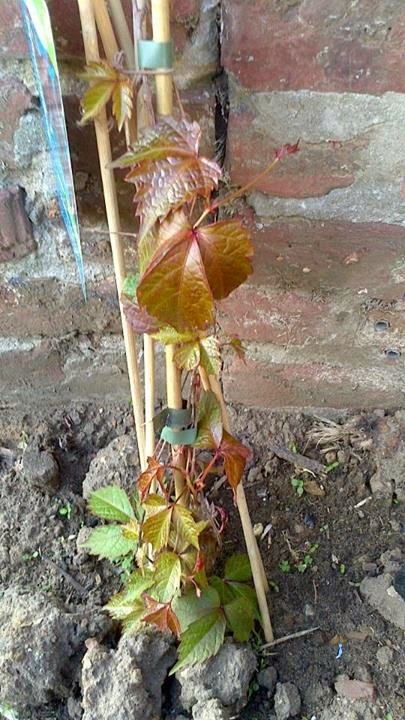 I have been pining for a Boston Ivy (a Parthenocissus tricuspidata Veitchii in particular) and we got one in the garden centre on Saturday and planted it yesterday. We removed some floor tiles in the street next to our façade and replaced some of the compacted sand with nice soil and a little dried manure. I also added some supports and recycled chicken coop wire that I found in the garden, to protect this still very fragile young plant. So looking forward to the climber to grow. Grow, little plant, up the wall! In fact, last year I already bought one of these in anticipation for the townhouse approval. Since I was afraid it would languish in the little pot, I planted it against the back wall, at the beginning of the garden.